About AccountSight: AccountSight is a fast and easy online time tracking, expense recording and invoicing software. It is a highly useful cloud bases application for small businesses, consultants and freelancers for maintaining timesheets and billing online as well as for mid-size companies that require online projects management, employee time & expense tracking and billing capabilities. The rich functionality and hassle free user experience makes AccountSight unique. Create online project estimates for your clients in seconds. Professional and stylish PDF templates for project estimates to include personalized branding for prospective clients. Configure your cost items and add notes optionally. Email project estimates to potential clients. Predefined templates to impress your clients. Generate project estimates in multiple currencies. So regardless of which country the user or potential clients are located in, the user can send international estimates and expand globally. Maintain and monitor status of all sent, accepted and rejected bids easily for each project estimate. 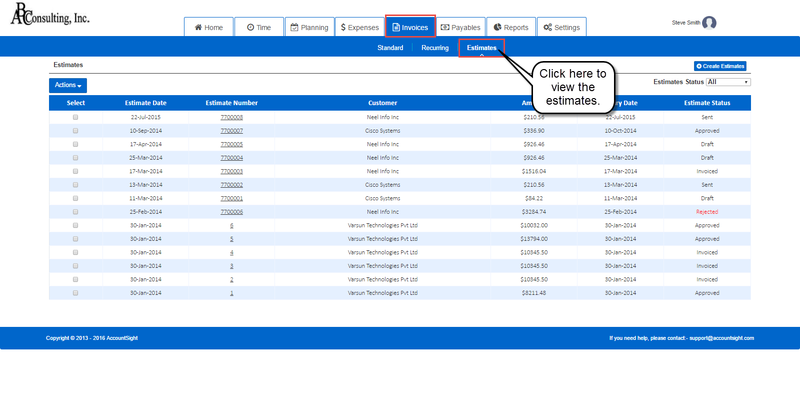 Copy or delete any existing estimate easily. Convert the project bids into invoices as soon as the quote is converted into an order. Project Estimates Overview: Before time and expense tracking and invoice management, project bidding is essential. AccountSight project tracker offers the project estimates feature which enables the users to easily and quickly generate online project estimates for bidding to any prospective client. Only Admin can create estimates for any prospects.